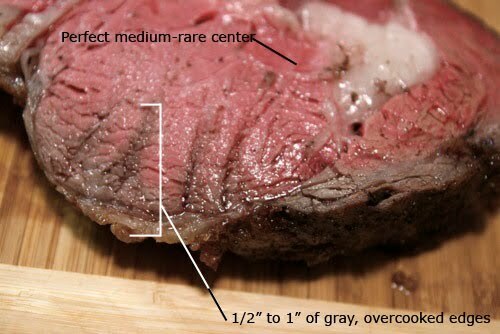 Perfect Prime Rib Roast every Time.- This works for any size roast too. To guarantee a perfect crust, allow it to air dry in the fridge, uncovered on a rack, from the night before. Season it with salt as this will allow to penetrate and flavor the meat. 2-As soon as the thermometer reads the temperature you're looking for, take it out of the oven, cover it with aluminum foil and allow to rest for at least 30 min in a warm spot in the kitchen. The roast can rest for up to 1.5 hours, so you could do it earlier in the day and finish it once you're ready to serve which can be pretty practical. 3- When you are about 20-30 minutes away from serving, turn up the oven to the highest possible setting, around 500 or 550 F. When you are about 10 minutes from serving and everything else is ready, remove the foil from the roast and put it back into the oven and allow it to form a crust. It should get a well browned and crusty exterior. This takes from 6 - 20 minutes depending on your oven so check it at 6 min and decide if it needs additional time or not. Mine took 9 minutes to get perfect. Once it's done, take it out, carve and serve at once! Here are some examples: Picture #1 is meat perfection (This is what you want) while Picture #2 shows overcooked edges and damage all over (Not very nice).... ok? The recipes on my menu are all on the blog and you can use the search bar and find them. For those of you that have never tried cooked radishes, try them, they are a Fren ch staple and they know a thing or two about food..... If you want any recipes let me know and I will be more than glad to send them on.... Rene is almost ready, the mise en place is done and maybe we can begin working on our afternoon Croquembouche project.... goodie, goodie and YUM!